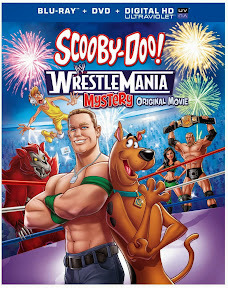 In case anyone wondered what names Shaggy and Scooby would use if they were WWE Superstars, Warner Brothers Animation’s all-new straight-to-disc WrestleMania themed Scooby-Doo feature answers that question late into the movie when they find themselves facing off against Kane in a championship match once the announcer dubs them Skinny Man and Dead Meat. Having won an all-expense paid trip to WWE City after they aced the victory dance routine in their video game and unlocked the special reward, smackdown superfans Shaggy and Scooby guilt the rest of the Mystery Inc. gang into traveling with them to the wrestling-themed destination. 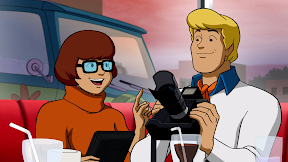 Presenting them with a huge stack of photographic proof that illustrates Shag and Scoob’s continual willingness to serve as mystery bait in order to lure villains out of hiding to reveal their true identities, soon enough the other members of the group relent. Giving in, we learn, is anything but a selfless act. Namely, the trip offers an added bonus for Fred to test out his new high tech camera’s ability to take killer action shots along with Velma’s interest in turning the trip into a sociological study of warrior rituals while likewise giving her and Daphne plenty of hot male eye-candy upon which to feast their eyes. So excited to hit the road that they forget to bring their luggage (which doesn’t exactly put a damper on things since they always wear the same clothes), Shaggy and Scooby relish in their powers of persuasion… until they find themselves serving as mystery bait yet again. Working alongside the eager and helpful John Cena, Scooby and the gang try to get to the bottom of who’s really behind WWE City’s mysterious Ghost Bear sightings that have wreaked havoc on the community and injured some of wrestling’s biggest stars including The Miz. When the championship belt is taken and all evidence points to the perpetrator being a member of Mystery Inc., Shaggy and Scooby must take to the ring to clear their name unless the others can solve the mystery first. 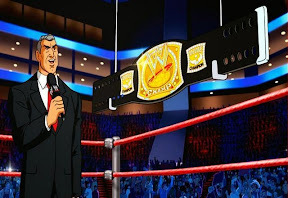 Although the film is admittedly on par with an extended animated ad for the WWE, it turns out that the colorful larger-than-life characters of WrestleMania fit right in with the same ones we've seen throughout Scooby-Doo’s television and film history. And this seamless WWE/Scooby blend is especially evident in a hilariously tongue-in-cheek yet creative faux ancestral backstory for the flamboyant superstar Sin Cara that we’re treated to in a flashback storytelling sequence which may help explain the supernatural element of the mystery. Beautifully animated and richly detailed with energetic voice work by the cast, this Scooby-Doo feature easily surpasses the disappointingly juvenile live action adaptations by keeping in the same spirit of the original Hanna-Barbera cartoon, despite its obvious aesthetic improvements. Despite this, the resolution to the mystery is slightly upsetting in terms of the politically incorrect rationale it provides as a motivating factor for mayhem which falls back on cinema's age-old disability stereotypes. Nonetheless, if you overlook the disappointing summation of who the villain is and why, you’re left with an otherwise above-average new entry in the vastly popular Scooby-Doo series that has sold over a billion discs to date to fans across the generations. While normally outdone by the stellar DC Comics movies, Scooby-Doo! 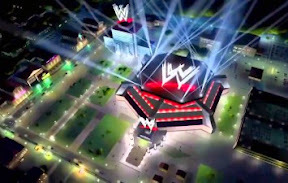 WrestleMania is surprisingly superior to the division's most recent Warner Animation outing Justice League: War. However, fans of both series (like this reviewer), will be thrilled to discover that one of the greatest perks of this Blu-ray Combo Pack (which also boasts a DVD and digital copy) is its disc-opening trailers which offers you a glimpse of what’s coming next from the studio with a preview of Son of Batman.